Article on the rise of Backcountry Alliances in the US. Moonshine Ink, Feb 2016 Online article "Midseason Concern" - Lake Tahoe avalanche issues. Backcountry Magazine, Oct 2015 online article "Keep Tahoe Skiable: Rich Meyer a man behind the formation of the new Tahoe Backcountry Alliance Talks Backcountry Access"
Moonshine Ink. 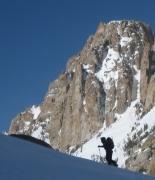 Oct 2015 online article "Plucked Out Pullouts" - Backcountry Skiing - Parking Issues in Lake Tahoe.